Creating these recipes for National Soup Month, the number one word on my brain was comfort. I wanted each of these recipes to feed the body and the soul while warming you up in the process. Well, we got hit with some pretty rough winter weather in this last week. Nothing outrageous or that we Chicagoans can’t handle but COLD. The kind of weather where you have to eat something piping hot for dinner or you might turn into an icicle before bed. Lucky for all of you (and me, of course), this recipe was written on one of those bitter cold days. It started out as a Beefy Vegetable Soup. There was going to be lots of tender chunks of beef and plenty of vegetables. As I started playing with spices, it turned into a Southwestern-style soup. With the Poblano Pepper and that Ancho Chili Powder, it became this flavor-packed, almost smoky soup. It’s a lot of ingredients, a lot of chopping, and a few minutes to cook but so worth the effort. What’s even better is that this recipe creates a large batch of soup that you can stash away for quick weeknight dinners. There are a couple tricks to make this soup extra hearty. First, toss the beef in flour that is seasoned with salt and pepper. This gets a nice caramelization on the beef when you brown it. The loose flour will thicken the soup, and while you’re browning the beef you’ll get all this brown stuff stuck to the bottom of your pot. This is a good thing. It might seem like you destroyed your pot after browning the meat but once you start adding in the vegetables and they release their liquid, the brown stuff will slowly release from sticking. This is a process called deglazing. Normally it’s done with a liquid like beef broth or wine but because there are so many vegetables, most of it will come loose before you start pouring in the stock. So do not panic when you see how crusty the bottom of the pot is getting as the meat cooks. Those are little flavor bombs that will make your soup insanely delightful. Second...do not drain the kidney beans. I know it might sound weird, especially since almost every single recipe requires a rinse and drain before using, but all that thick juice is a great thickener. There’s no starch in the recipe - no potatoes and no pasta. The starch will oftentimes act as a thickener by soaking up a bit of the broth. 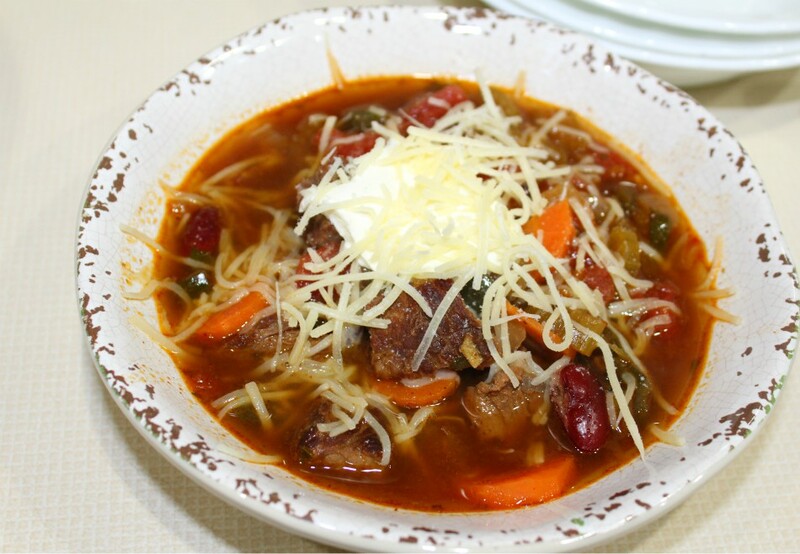 Between the flour coating the beef and the starchiness from the bean juice, they’ll give the soup a thicker, heartier consistency and both also help yield greater flavor. No. But it can be. Omit the flour. Season the beef generously with salt and pepper and brown as is. You won’t get as much of the crusty brown stuff on the bottom of the pot to deglaze but it will still be a tasty soup! Yes, it is! No dairy in this one although I did top the soup with a dollop of sour cream and some white cheddar cheese. That’s completely optional. Kind of. I can handle spicy food pretty easy but this soup has a bit of kick to it. If you’re not a fan of a lot of heat, I would suggest omitting the Cayenne completely and only using ¼ tsp of Cumin. I’d also start with ½ tsp of Ancho Chili Powder, tasting it, and adding another ½ tsp. If you can handle it a bit spicier. The cardinal rule with spice is that you can always add more but you can never take away. So when in doubt, start small and gradually increase how much you add a little at a time. 2 tbsp. Grapeseed Oil + 1 tbsp. 1 - Place the beef in a large bowl, sprinkle with the flour, salt and pepper, and toss together to coat the meat. Heat 2 tbsp of Grapeseed Oil in a large soup pot over medium-high heat. Add the beef (in batches if necessary) and brown on all sides. Remove to a plate. 2 - To the pot, add the final tablespoon of Grapeseed Oil. Add the onion, garlic, carrots, celery, poblano pepper, spices, and herbs. Cook 10-12 minutes until softened. Add the tomatoes, beans, and beef stock. Add the meat back to the pot, bring to a boil, and cook 30-45 minutes until the meat is cooked and tender. Serve with a side of crusty bread.